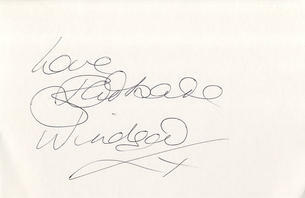 This is a Hand Signed white card 6" x 4" by the English comedy actress. Barbara Ann Deeks, MBE (born 6 August 1937), better known by her stage name Barbara Windsor, is an English actress. Her best known roles are in the Carry On films and as Peggy Mitchell in the BBC soap opera EastEnders. Born in Shoreditch, London in 1937, Windsor was the only child of John and Rose Deeks, who were a costermonger and dressmaker, respectively. Windsor is of English and Irish ancestry. She passed her 11-plus exams with the highest marks in North London, and won a place at Our Lady's Convent in Stamford Hill. Her mother paid for her to have elocution lessons, and she trained at the Aida Foster School in Golders Green, making her stage debut at 13 and her West End debut in 1952 in the chorus of the musical Love From Judy. Her first film role was in The Belles of St Trinian's in 1954. She joined Joan Littlewood's Theatre Workshop at the Theatre Royal, Stratford East, coming to prominence in their stage production Fings Ain't Wot They Used to Be and Littlewood's film Sparrows Can't Sing in 1963, achieving a BAFTA nomination for Best British Film Actress. She also appeared in the 1964 film comedy Crooks in Cloisters, the 1968 film Chitty Chitty Bang Bang and in the sitcoms The Rag Trade and Wild, Wild Women.